The Edinburgh Art Festival is always a highlight of my August and I decided to start with the big players and see the blockbuster shows first of all. The National Galleries of Scotland are showing a Peter Doig exhibition – a homecoming for the Edinburgh born artist although I don’t think many would instantly associate him with Scotland. After all, he moved to Trinidad when he was two and, despite much moving around in the meantime, he has now moved back there. 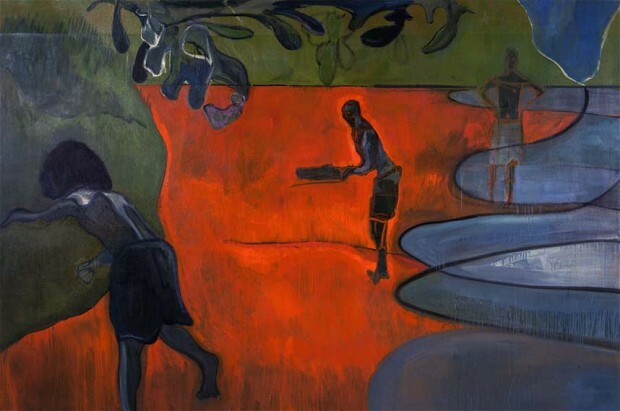 The exhibition focuses on works from the last ten years and, naturally, his paintings reflect more the Trinidadian lifestyle and culture than the rugged Scottish landscape. Peter Doig, Paragon, 2006. Image via www.telegraph.co.uk. Doig really is a master of paint. One of the highlights for me, and I’m sure for many others too, was Man Dressed as Bat from 2007 – a beautifully washed out work that can no doubt be read as a study in evanescence and transparency. 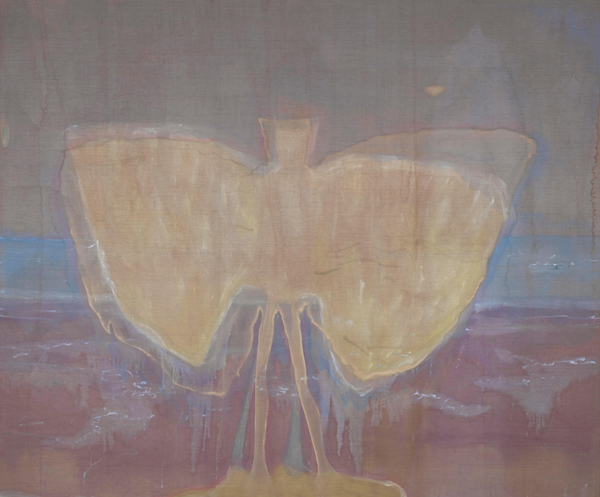 Before Doig started this work, the canvas was affected by rain coming into the studio. Doig liked the effect and allowed it to suggest an approach to the painting whereby successive layers of paint barely mask those underneath. The result is ghostlike; we are trapped in a dream that slowly reveals itself to us. There are other similar works with an equally wonderful diaphanous texture. Although I don’t like all of Doig’s works, it is his subtlety and the transparent fading hues that form his true masterpieces and this exhibition captures the impressive quality of Doig’s oeuvre showing his over-riding commitment to one media. Peter Doig, Man Dressed as Bat, 2007. Image via www.nationalgalleries.org. One room shows his Studio Film Club Posters – Doig and Lovelace established this club in 2003 and Doig made hand-painted posters to advertise the weekly films that have a raw spontaneous quality almost reflecting some of the makeshift signs found in Trinidad. The paintings throughout the exhibition have been arranged in a way to challenge each other and show the development of ideas through his works. Doig does not paint from real life but devises his images from diverse sources including photographs, films and even memories. This does sometimes make it hard to connect truly with the canvases – they aren’t abstract but they aren’t fully present, they remain tantalisingly inaccessible to us, trapped in Doig’s own ‘foreign land’. His works linger in one’s mind and don’t quite disappear, the ghostly images calling from room to room. Although I was short of time, with the Fruitmarket Gallery just across Princes Street Gardens, I couldn’t resist a quick visit. 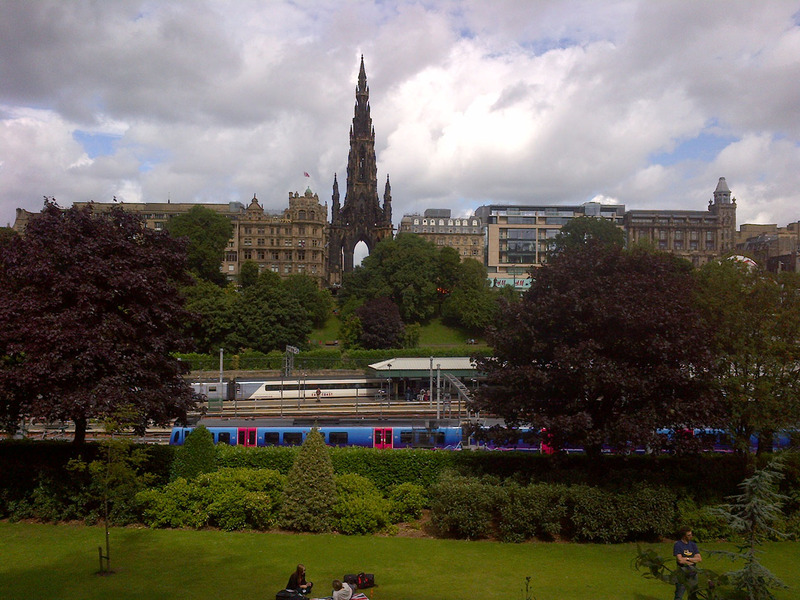 Princes Street Gardens. Own photograph. 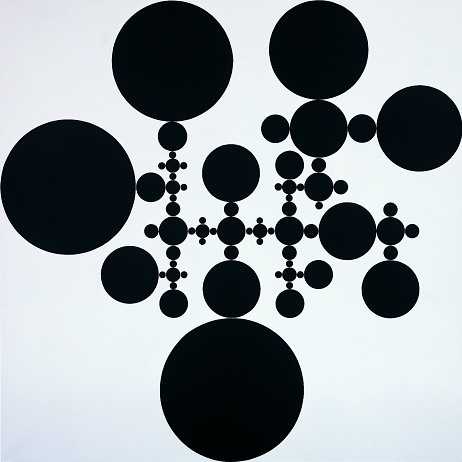 This summer their focus is on Gabriel Orozco and the exhibition takes his 2005 painting The Eye of Go as a starting point – a computer-generated pattern of black circles. The thinking behind this show requires time and concentration but demonstrates the enormous range of materials and practices he uses to exploit the circle’s capacity to be an ‘instrument’ rather than just a geometric form in a composition. His re-workings of this motif are rigorous and obsessive. Circles appear as gestural sweeps of ink on paper, or points on meticulous grids in pen and graphite, as cuttings, inscriptions on tickets, letters and photographs and cedar wood, as wet pools of colour or dense ink impressions and shaded graphite spheres. The possibilities are endless. But these are far from just circles and at times you almost forget that this is the focus of the exhibition so fascinating are the works. Gabriel Orozco, The Eye of Go, 2005. Image via www.edinburghartfestival.com. You may not automatically think of an exhibition around circles to be the most dynamic that you will see but this exhibition seeks to shine light on Orozco’s practice and diverse methods. Upstairs at Fruitmarket Gallery. Own photograph. I decided to have an art day and headed over to Modern One for what has to be described as a sublime exhibition – From Death to Death and Other Small Tales – which I was lucky enough to be shown around by Simon Groom as part of a Courtauld alumni event. The title stems from a Joseph Beuys work and the exhibition seeks to create a conversation between works from the gallery’s own collection and pieces from the collection of Dimitris Daskalopoulos that focus on the human body. Some works reference the body explicitly while others make subtle gestures to bodies that may or may not be present. The works presented often confront art historical tradition through similarity in subject matter. 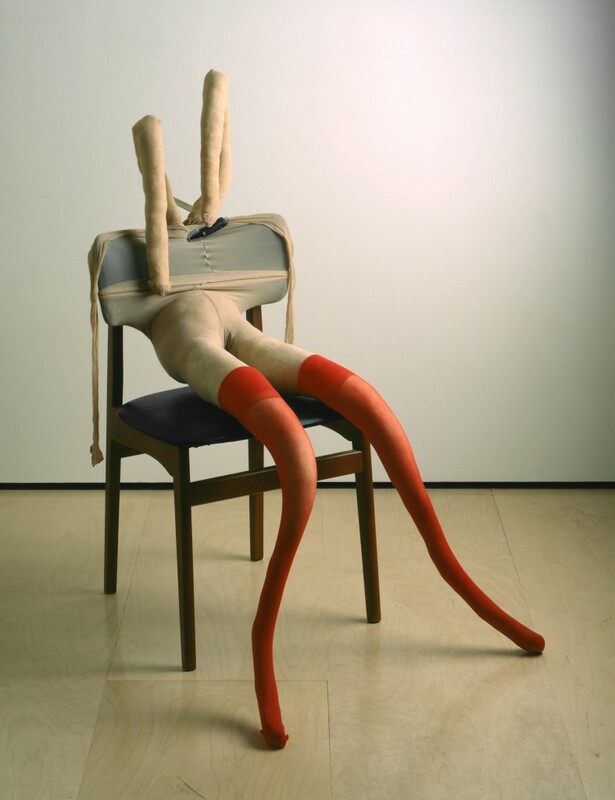 Sarah Lucas, Bunny Gets Snookered, 1997. Image via www.fadwebsite.com. There are the works we’d expect such as Sarah Lucas’s Bunny Gets Snookered which picks up on the tradition of full frontal female nudes. But for it to be seen in this context is unusual and it really is good. Every show about the body has to have a Tracey Emin and we aren’t left disappointed but then there are also some extraordinary surprises, particularly the 15 or so rarely seen works by American artist Robert Gober. These turn everything on its head, often focusing on duality and collision of ideas. 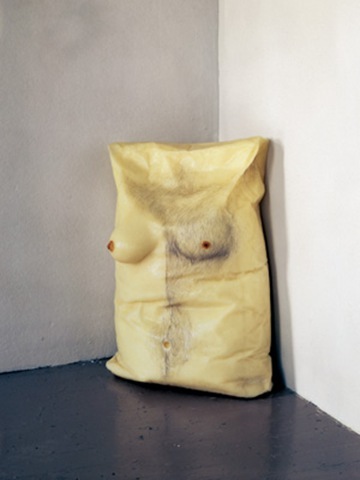 Robert Gober, Untitled (Torso), 1990. Image via www.thisispipe.com. Marcel Duchamp’s Fountain for once is not taking centre stage. Here, it is removed from its pedestal and placed in a corner, allowing the other works to come forward and take their rightful place in the spotlight. Chadwick’s Piss Flowers are very simple but utterly beautiful. Chadwick pissed in the snow and cast the remains, memorialising something that did not even exist. The smell permeating through the ground floor galleries comes from Ernesto Neto’s labyrinth-like installation, It Happens When the Body’s Anatomy of Time where columns, made from gauze, are weighed down with aromatic spices, dividing the space. It is a very contradictory piece that feels like it was made for the space. 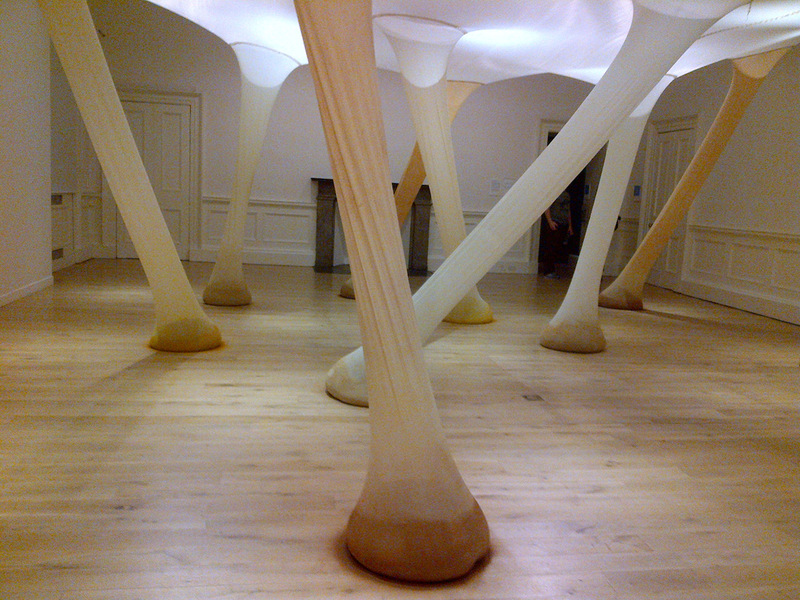 Ernesto Neto, It Happens When the Body’s Anatomy of Time, 2000. Own photograph. The exhibition also includes all of Matthew Barney’s Cremaster series in one gallery – five feature length films set in a folkloric world of his own invention. It would take a day to get through these incredible films and, indeed, I was quite upset I hadn’t known sooner that they were here. Seeing them all together in this incredible performance/installation is mind-blowing. Not many rooms are given over to one single artist but this room is all-encompassing and mesmerising. A still from the Cremaster series. Image via www.artsbournemouth.org.uk. Nearly every work in this exhibition deserves a mention which is a surprising feat (there are of course always some pieces that don’t float your boat and I will never be a fan of Paul McCarthy’s Pirate Party that takes over an entire room and can be heard in a couple of others). I’m used to exhibitions at Modern One occupying only the ground floor but this one is so extensive it takes over the entire building with around 130 works of top quality, playing to the gallery’s own strengths while showing their curatorial expertise. It’s fabulous with contrasting atmospheres throughout. This is an opportunity to see works that get very little exposure. The gallery have created an exhibition that really works without compromise. There aren’t many wall texts around the exhibition – we are allowed to make up our own minds without intervention and can then read the excellent catalogue at a later date. This exhibition has been open since the end of last year and is closing early in September. If you were having an urge to pop to Edinburgh then seize it – after all you can always go for the day like I crazily did last week. I popped back to London for a few days last week too and took the opportunity to see Conrad Shawcross’s Timepiece which is currently transforming the Roundhouse. As a Shawcross fan, this was always going to be a winner for me. He describes the piece as ‘an engine driving a functioning clock’. Each hand is fitted with a 1000-watt bulb and solely the light from the installation illuminates the room. The shadows are sent over the entire Roundhouse creating a huge sundial. 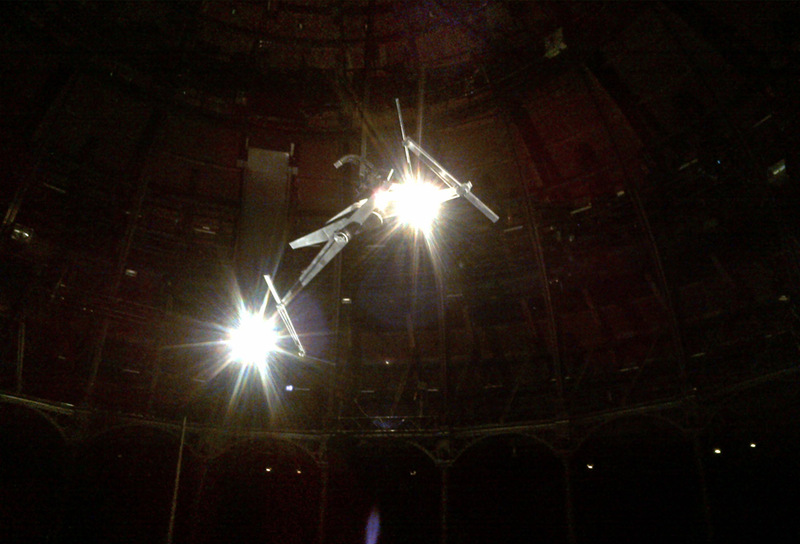 Conrad Shawcross at the Roundhouse. Own photograph. We are normally used to seeing the Roundhouse as a concert venue filled with loud noise and hubbub. Timepiece has completely transformed the space. It is now one of hushed contemplation with people sitting on the floor gazing at the four-metre high contraption as it rotates and moves at different speeds. The work is poetic and isn’t just something to take a quick glance at. It deserves consideration. Ironically it is easy to lose track of time watching Timepiece work its magic. Peter Doig, No Foreign Lands is at the Scottish National Gallery until 3rd November, http://www.nationalgalleries.org/. 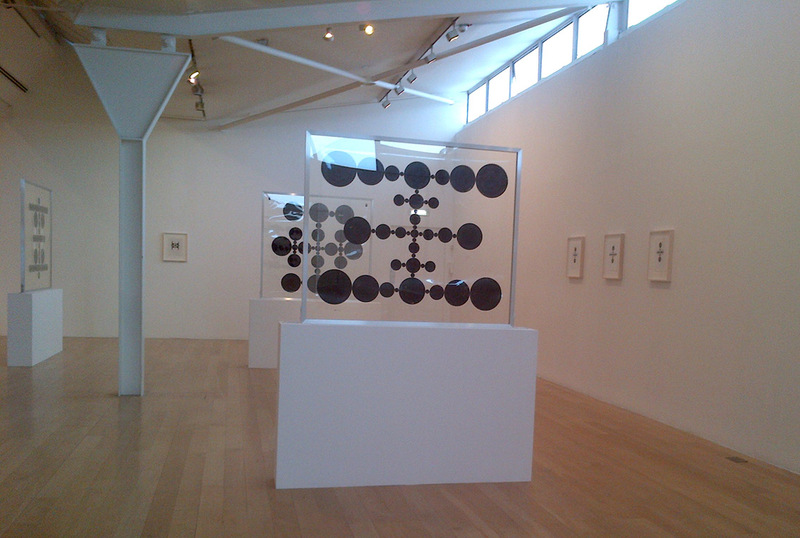 Gabriel Orozco: Thinking in Circles is at Fruitmarket Gallery until 18 October, http://fruitmarket.co.uk/. From Death to Death and Other Small Tales | Masterpieces from the Scottish National Gallery of Modern Art and the D.Daskalopoulos Collection is at Modern One (Scottish National Gallery of Modern Art) until 8th September, http://www.nationalgalleries.org/. Conrad Shawcross’s Timepiece is at the Roundhouse until 25th August, http://www.roundhouse.org.uk/conrad-shawcross-timepiece.